I hold a special place in my heart for La Maison du Chocolat, having had the fortune of having had a meal composed entirely of chocolate while in Paris. I’m not kidding in the least – there were truffles, and a demi-tasse of hot chocolate, accompanied by a bowl full of billowy whipped cream. Oh, and there was a glass of cold chocolate. And maybe a macaron or four. So, when La Maison du Chocolat reached out to me and inquired as to whether I would be interested in sampling something from their holiday collection, there was absolutely no hesitation. What arrived in the mail was their Petit Mendiant Pendant, a glorious combination of nuts and chocolate designed to be hung from a Christmas tree as an ornament for as long as your chocolate-hungry soul will allow. Opening the package reveals 180 grams of exquisite dark chocolate, almonds, hazelnuts, pecans, and pistachios, covered in edible gold flake. And, seeing that it had arrived weeks before a tree would ever grace our livingroom, we had no choice but to dive into it immediately. The verdict? There’s a reason why La Maison du Chocolat is one of the leading purveyors of luxury chocolate, and the Petit Mendiant Pendant is a just one example. The piece is no delicate work, far from it – I used a butter knife to crack the thick pendant into rough quarters, and the combination of rich chocolate and nuts ensured that I would be satisfied extending the experience over several nights. And when all was said and done, I still had that beautiful red ribbon as a reminder of it all. The Petit Mendiant Pendant is available in La Maison du Chocolat boutiques and online. Note: Writing holiday posts has always been a challenge, because for a number of years, even before starting The Best Food Blog Ever, I have always stayed true to the same recipes. And while tradition once again trumps innovation for this holiday season, when I started to consider how many new followers on Twitter and new readers I’ve gained over three years, it just made sense to repost my entry for roast turkey because, hey, it’s going to be new for someone out there. First published here in 2008, and you’ll probably see it come around again at this time next year, and the year after that. I promised to post the Thanksgiving recipes in time for Christmas, so here’s the final, and probably the most critical, one. As I’ve already mentioned, this roast turkey recipe is a blend of different preparations that I’ve used over the past few years. I’ve taken the best aspects of every preparation that I’ve used, and this is the result. When I first decided on a recurring holiday turkey recipe, I started out by using a liberal application of herbed butter under the skin of the bird, which does a better job of flavoring the meat than basting or cavity aromatics would. If you think about it, basting merely flavors the skin, and no matter how often you ladle pan drippings over the roast, those drippings do nothing but run down the outside of the bird back into the pan. Psychologically, it’s satisfying, but technically basting accomplishes nothing since the skin acts as a barrier. The same is true for stuffing things into the turkey’s cavity – no matter what you put in there, the meat will still be shielded from the aromatics by the bone structure of the bird, so the effect is minimized. Using an under-the-skin application of herbed butter achieves two goals – it flavors the skin from beneath, and it also imparts a wonderful flavor to the meat below. So, that’s the approach that I used for years, until I discovered brining, and now I use a brine-and-butter approach. Brining takes the notion of flavoring the meat one step further, by immersing the bird in a salt and sugar solution for approximately 1 hour per pound. Take note, though, that you should never attempt to brine what is sold as a “self-basting” turkey – which has already been injected with a saline solution, and which will turn out inedibly salty if you elect to brine it further. Additional flavors are added to the brine according to the results that you’re seeking – the brine carries these flavors deep into the meat of the turkey. From a scientific standpoint, the brining solution breaks up the fibers of the meat, resulting in increased tenderness, and the retained moisture from a good, long brine will translate to juicier meat. I highly recommend using a brining bag, but you could use any food-safe heavy duty plastic bag if you need to. So, here is the holiday roast turkey recipe. The butter mix comes from a past issue of one of my cooking magazines, which I can’t recall after so many years, and the brining solution is sourced from Saveur, with a few modifications. Remember that you need to begin brining the turkey the night before you plan on roasting it, so if you want to make this for Christmas, you need to start on Christmas Eve. Start by making the brine. In a food processor or blender, puree the garlic, the apples, and the 2 cups of apple cider, and set aside. In the brining bag, set inside of a large stockpot, pour the salt, sugar, and chili powder, then add the 6 cups of apple cider and the 4 quarts of cold water, using your hand or a whisk to mix it all together so that the salt and sugar dissolve. Add the apple/garlic puree and stir to mix again. Prepare the turkey by first pulling out the utterly useless self timer plastic dart and throwing it away, being careful not to tear the skin as you do so. Remove the giblet bag and reserve for stock (this can be frozen, whole, in a plastic bag in the freezer). Carefully lower the entire turkey, breast first, into the brining solution, making sure the brine fills the cavity, and submerge as much as possible. Seal the bag and place in a cold place – your refrigerator if you have room, or the garage or deck if the outside temperature is low enough. You should anticipate brining the turkey for 1 hour per pound, thereabouts. The next day, take your butter out of the refrigerator and let it soften. Finely chop a few slices of bacon and fry them until crisp. In a small bowl, mash the butter with the salt, pepper, bacon, thyme, and sage and set aside. Set your oven to 350 degrees. Pull the turkey out of the brine and set it in a roasting pan on a rack, making sure to drain the cavity. Using paper towels, pat the turkey dry, then use your fingers to loosen the skin from the meat of the breast. Take a spoon and spread the herbed butter under the skin of the turkey – you can use your fingers to push the butter off of the spoon through the skin, and smush it around until you’ve got an even coating of butter throughout. Apply salt and pepper liberally to the surface of the skin. If you’re using a probe thermometer, which I highly recommend, insert the probe now into the thickest part of the thigh without hitting bone. Roast the turkey until the temperature of the dark meat reaches 165 degrees. You may want to check the bird after about an hour or so, because the residual brown sugar from the brine will caramelize, causing the skin to become brown more quickly than you are accustomed. If this happens, take the turkey out and tent it with foil before putting it back to finish cooking. When you take the final temperature of the roast using a probe thermometer, it’s best to poke it in various discreet locations – all parts of the bird should register at least 160 degrees, which is done but not dry. Remove the turkey from the oven and set it aside, tented with foil, for at least 30 minutes. If you hazard cutting into any roast before it has had proper time to rest, you risk spilling valuable juices and ending up with dry meat. The resting period allows the juices, which are pushed to the surface during cooking, to recede back deeper into the flesh. Don’t worry about the turkey getting cold – depending on its size, the roast will retain heat for close to an hour or more, and your kitchen, if it’s anything like ours, will be plenty hot anyway from all of the other cooking that’s going on. “Pace yourself,” I was told as I picked up my badge at the registration desk for this summer’s Fancy Food Show. Truer words were never spoken. Three years ago, I attended my first Fancy Food Show at the Jacob Javits Center in New York, where I proceeded to utterly fail at pacing myself. Upon entering the cavernous exhibit halls, I was immediately overwhelmed by the cornucopia of high-end cheese, chocolate, olive oil and other specialty food offerings, all accompanied by the background hum of the distributors, producers, brokers, and other industry representatives wheeling and dealing in a dozen different languages. It’s magical. It’s electric. It is also very exhausting. By the time we had reached the end of the second aisle, as measured from the front of the Javits Center to the back wall, we found ourselves full from samples, our progress slowing and hampered by our efforts to negotiate the crowds. The worst part? It took us close to an hour just to get through two aisles. Over the next two days of nearly constant walking, sampling, and frequent stops to rest, we only managed to see about a third of the 2,300 exhibiting companies that year. The next year, having obviously not learned my lesson from the prior year, I made the naive commitment to covering the entire show, all floors, all booths. Over the course of three days, I hit every vendor from every nook and cranny of the culinary universe – from the largest European pavilions down to the Mom and Pop businesses selling products based on a family recipe. On the third day, after visiting the most remote booths of the lower level of the convention center, my mission was accomplished. But instead of feeling a sense of achievement, I felt burned out, unable to process all of the information into a coherent thought. My legs and back hurt for days afterwards. This year, I settled on a hybrid approach to covering the Fancy Food Show, one that would focus on discovering the vendors and products that were nominated for sofi awards, considered by many to be the Oscars of the specialty food industry. I would bypass any vendors that were already familiar to me, or whose products I had already sampled in earlier visits. I would seek out products that were awarded the sofi Silver awards, with special attention to those that were in the running for sofi Gold awards. I was intent on walking the entire exhibit floor, but not necessarily stopping at each exhibitor. It would be the equivalent of strolling through an art museum, but not reading the description of each individual work. There are, of course, always exceptions to the “no familiar vendors” rule. It’s an imperative to visit the Vosges booth to sample such wares as their Black Salt Caramel Bar (sofi Gold winner for Chocolate) and to indulge in what was probably the best brownie that I’ve ever had in my lifetime, still warm from the oven. Nueske’s produces the finest bacon and smoked meat products on the planet, so it would be ludicrous to bypass a free sample. Sometimes, you can even be caught off guard by a food that’s familiar, but produced at a level of quality that far exceeds anything you’d expect from a packaged product, as was the case with the Hancock Gourmet Lobster Co.’s line of products that included lobster pot pie, lobster corn chowder, and lobster mac and cheese that you would swear were never frozen. sofi Gold winner for Outstanding Product Line? Absolutely. One of the thrills of attending a Fancy Food Show is being able to spot and taste innovative products before they hit the mainstream, and sometimes before they’re even released for sale to the public. For example, one of last year’s most interesting new products, black garlic, is just now starting to appear on grocery store shelves. Not the same as roasted garlic, black garlic presents itself as a sweet and savory flavor that’s hard to identify at first, and it’s starting to see integration into restaurant dishes. Garlic also played prominently in this year’s awards, with the sofi Gold award for best new product going to GarLic It!, which describes itself as a private reserve caramelized garlic finish. Having received a sample of GarLic It! a few days ago, I popped open the jar and stirred a tablespoon of the bronze shards into a pot of orzo, transforming it into an upscale accompaniment without any effort whatsoever. It’s the thrill of these types of discoveries that keeps me coming back to the Fancy Food Show. I even found the change of venue to Washington DC, triggered by long-term renovation work at the Javits Center, to be refreshing, since I was able to leave the convention center and be within walking distance of the hotel and other points of interest. I could hear the excitement in my wife’s voice when she called me. Shortly after moving into the area, we had discovered a farm about fifteen minutes away, offering Pick-Your-Own produce throughout the growing season, and a thriving apple and pumpkin business in the fall. While we had started with tomatoes (no longer offered, sadly), the lure of freshly-picked berries and fruit soon led us to establish a pattern, an ushering-in of summer marked by cherries, blueberries, and the occasional foray into black and red raspberries. Of these, cherries are the most challenging, due largely to their very short window of availability. Last year, we missed cherry picking completely because we had to be out of town for one weekend. That’s it – just a single weekend away from home meant the difference between picking our own cherries or paying the markup at the supermarket for hardy, non-local varieties bred to survive cross-country shipment by truck. It’s due to a combination of voracious families of pickers and a life cycle that sees cherries ripen and fall off of the trees within days. This year, I was visiting the farm’s website every few days, hoping to see some sort of announcement regarding cherry season, but the blog remained mysteriously static as we entered the month of June. But armed with her secret information, Jennifer decided to take her lunch break and go picking while the rest of the unsuspecting cherry-loving populace toiled away in their cubicles. She came home with 27 pounds of cherries, filling almost three cardboard trays. The next day, we went back for more. Returning to the cherry trees, I could see why she had been so productive in such a short time – the trees were filled with cherries, making the use of a stepladder unnecessary. Camping out in the midst of the branches and leaves of one tree, I made quick work of tugging gently on the ripe fruit, which popped out into my palm for transfer to my tray. We only stayed in the field for a short while that day, knowing that the bulk of this year’s picking had already been accomplished. A little over an hour later, we returned home with nine additional pounds of fruit. That weekend, we lost a lot of sleep. Planting ourselves firmly on the couch, we pitted cherries for hours as we watched movies, going to bed well past midnight only to repeat the process again the following night. 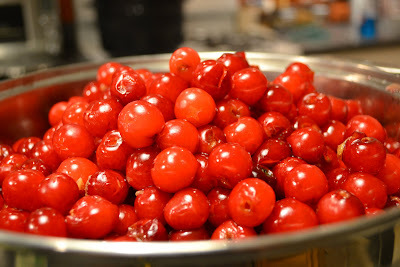 When it came time to transform the fruit into preserves, we discovered that 27 pounds of cherries never really reaches the magical temperature of 220 degrees that’s required to make the mixture firm up, no matter how long you leave it at a boil. We canned them anyway, choosing to be satisfied with capturing the essence of summer, even if that essence wasn’t as set up as we would have preferred. In the week that followed, I started thinking about those jars of loose preserves. As I was driving home through typical rush hour traffic, I remembered that, when canning, jars that fail to achieve an airtight seal can always be reprocessed without any safety issues. It then occurred to me that it may be possible to reprocess the cherry preserves in smaller batches in order to hit the right temperature. When I got home, I opened four of the half-pint jars, dumping the contents into a saucepan over high heat. Sure enough, within minutes the mixture was at a full boil, and soon the readout on our thermometer crept up to 220 degrees. We reprocessed the smaller batch in boiling water, hearing the loud pop of the lids as they cooled on a kitchen towel on the counter. Before going to bed, I grabbed one and turned it upside down, to find, happily, that the preserves had fully set. Now, even taking into consideration that four half-pints turn into two half-pints when reprocessed, we still have enough cherries to last us well into the start of next year’s picking season. Every so often, I’ll meet someone new and mention that I have this site, and they’ll ask me what I write about. No matter how many times this happens, I always find myself awkwardly reaching for an answer, unable to encapsulate a response into a neat sound bite, and I ultimately end up rattling off a laundry list of things that I don’t write about instead. Reading this account of the demise of a food blog in Buffalo, New York made me think long and hard about how I view myself as a writer, and how I want others to view me. Since the inception of The Best Food Blog Ever, I’ve always regarded myself as a food writer. In that singular declaration, though, are a lot of presumptions that need to be dismissed. For one thing, I’m not a food or restaurant critic. I’ve never felt that it was my place to decree that anyone that happens to find themselves reading my material should be obligated to like and dislike the same things that I do. Words have power, and words that you publish on the Internet have enduring power. If a restaurant has a bad night, with an unfamiliar face filling in for a sick chef, or a large party that lingers, causing booked reservations to pile up in the foyer, or for any one of a million unknown factors, I’m not going to memorialize the displeasure of that evening in an entry. On the other hand, if I have a fantastic experience, one that goes beyond all of the expectations that I had when I laid my hand on the front door, sure, I’ll write about it. In the realm of restaurant cuisine, it’s far more likely that an establishment has the occasional off night than to have a consistently bad place that occasionally gets it right. Restaurant critique is best left to the professionals, whose livelihood depends on being able to weigh the quality of a dining experience in as objective a fashion as possible. For most of us on the web, without formal training, this isn’t possible. There are too many bloggers, and I’m including everyone on Yelp, who believe themselves to be the next Ruth Reichl, Frank Bruni, or Craig LaBan. I also don’t publish recipes on any regular basis, and in saying that, it’s not my intent to knock those sites that do. One of the reasons why food blogging is so popular is that, if you’re focused on recipes, you can count on being able to generate at least one new recipe per week, and likely many more. In the early days of The Best Food Blog Ever, I dabbled in recipe design, and almost immediately felt suffocated by the limitations of that writing model. In my mind, recipe writing and food writing are different animals. There is a scientific, methodical approach to recipe writing, and while you may have endured many long hours experimenting with different ingredients in shape, form, and quantity, ultimately your end product consists of a list of components, followed by numbered steps telling folks what to do with them. Finish it up, take a good photo, then post it. This is not to say that I’ll never write another recipe ever again, but unless I have a dish that’s truly inspired, it’s just not anywhere near the top of my list. There’s got to be a story that drives the recipe in order for me to consider posting it. I was asked to submit a recipe that will be published in a compendium later this year, and, to be honest, I enjoyed writing the headnote the most. With all of that said, sometimes writing for The Best Food Blog Ever is the hardest thing to do, and also the most rewarding. Once you’ve eliminated restaurant reviews and recipes from the regular rotation, the universe of possibilities shrinks to a small solar system of prospective topics. From time to time, a particularly inspirational story just lands in your lap. One of the phrases that stuck with me, when I read the writer’s final entry on Buffalo Chow, was that “our system here…is too broken for me to fix it”. This, after enduring a meal at the Olive Garden and venting about the decline of the quality of restaurants in the Buffalo area, and of suspiciously biased reviews of establishments by the local papers. In the end, it seems that the blog died because, as a site focused on restaurant reviews, there was nothing left to write about. I’ll admit it, I eat at the Olive Garden. I’ve also eaten at Taillevent. 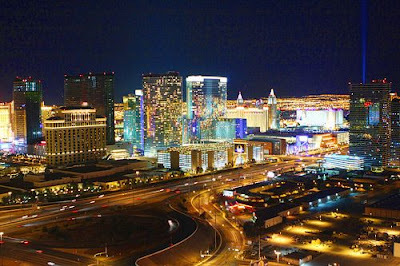 And in between the Olive Garden, with its vibrating, flashing pagers and Taillevent, where your bottle of wine is poured over a candle flame so as to avoid getting sediment in your glass, I will eat and write about an entire universe of food, if there’s a story to tell. I won’t tell you about the Olive Garden, because you and everyone else knows about the Olive Garden. Personally, I don’t find the food to be particularly epic or offensive, but the prices are decent, they have a great kid’s menu, and the atmosphere is loud enough to mask the sounds of a fussy baby. Now, if you’re going to the Olive Garden exclusively for the food, and you don’t have a baby with you, your own personal experience is going to lack two of the three important factors that appeal to me. But my experience is going to be different from yours, obviously. As a new parent, I enjoy the Olive Garden much more than I would have before the baby came along. Is it my responsibility, as a food writer, to “rescue” people from dining experiences that don’t meet up to my own personal standards for quality, value, or foodworthiness? Did the Olive Garden suddenly become a much better restaurant once I became a parent? Of course not. Our lives, perceptions, and priorities are in a constant state of change and evolution, and it just so happens that we’ve become part of the demographic that the Olive Garden has designed its restaurants to attract. 21 months ago, we weren’t in that demographic. Today, we are. The world of food writing is large enough to accommodate all of us, whether we choose to embrace the comforting uniformity of chain restaurants or elect to be the first reservation on opening night of the latest Farm to Table to Fork to Mouth to Gut bistro. No matter where you fall in the spectrum, it is my ambition to offer you the best writing that you can find on the web. Writing that happens to be about food, at least most of the time. It’s time for a new edition of Five Food Questions on The Best Food Blog Ever. Short, sweet, and to the point, Five Food Questions is designed to provide insight into the culinary lifestyles of interesting and compelling people who may or may not be directly involved in the food world. Today, my Five Food Questions subject is Jael McHenry, whose first book The Kitchen Daughter, about a young woman with Asperger’s Syndrome who discovers that she can summon the ghosts of dead relatives by cooking from their recipes, debuted this past Tuesday. 1. So, are you a writer who learned how to cook, or a cook that learned to write well? Which came first? Both, maybe? Neither? I guess writing and cooking are two things I feel like I’ve always done. I was writing little poems in second grade, and baking cookies with my mom around the same time, and I’ve just kept working at both throughout my life. But The Kitchen Daughter is the first time I thought to combine the two. I wanted to write a character who was passionate about cooking but had never used it to connect with people – I feel like food plays this great role in connecting people, especially family, and a character who cooks just for the process of cooking and not for the end result was really intriguing to me. 2. The main character in The Kitchen Daughter cooks from heirloom recipes. Do you find yourself cooking more from family recipes passed down through the generations, or from cookbooks? Cookbooks more often than family recipes, but I’m not a good recipe-follower. I’m always tweaking and substituting. Probably one of the reasons I cook more than I bake. I use family recipes for special occasions – pierogi, Cornish pasties, butterhorn rolls – and those, I never change. The rest of the time I’m often improvising in the kitchen, either with a recipe as a jumping-off point or just starting with the ingredients themselves as inspiration. 3. You used to live Philadelphia but now you live in NYC. How do the food and dining scenes stack up against each other? Oooh, that’s a loaded question. But there are things I love about both of them. I miss the BYOB scene in Philly – being able to walk into a place like Matyson or Mercato or a hundred other places with a bottle of wine you paid retail for – that just doesn’t exist here in NYC. There’s BYO here and there, but it’s not the same. In general, of course, New York has more of everything – more fine dining, more street food, more greenmarkets, more variety – and I have had a lot of incredible meals here in the past year. You can buy amazing ingredients in both places, and you can eat delicious food for $20 or $200 in both places. They’re two of the best places in the country for foodies to live. 4. What was the last thing you cooked? I made some killer black bean enchiladas last week with a blend of smoked cheeses and chile colorado for my book club. Enchiladas are generally a fallback for me when I don’t know what else to make, but these, I would definitely make again on purpose. Smoked cheese is a brilliant invention. 5. Name your favorite guilty pleasure food. Combos, no question. The cracker and cheddar (well, “cheddar”) kind. 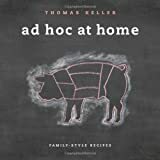 Once the exclusive province of fine dining kitchens and chefs whose names rhyme with ‘Lommus Beller’, sous vide cooking has recently emerged as a viable (albeit not inexpensive) option for the home kitchen. The technique, which involves placing food in a vacuum-sealed pouch, then immersing it into a water bath at a precisely-controlled temperature, has become such a staple of reality cooking television shows that it’s easy to perceive the process as something so complex, so prone to error, that it’s best left up to the professionals. But that simply isn’t true. As 2010 drew to a close, I received an email from Frank Hsu, an entrepreneur based out of Toronto who heads up a company named Fresh Meals Solutions, the manufacturer of a sous vide system called Fresh Meals Magic. Frank was kind enough to provide me with a Fresh Meals Magic setup, which consists of an immersion heater, a Sous Vide Magic controller, an air pump, and a large 18 liter plastic bucket. It’s far from pretty, but it works well, and the Fresh Meals Magic system offers a scalable solution that’s not limited by the size of a fixed container. And did I mention that it costs less than the Sous Vide Supreme, the more widely known market leader in sous vide products for the home? More on that later. Since receiving the Fresh Meals Magic system, I’ve dedicated myself to preparing nearly every protein imaginable using the sous vide technique. Starting with eggs, then progressing to steak, chicken, pork, and fish, I’ve accumulated a ton of notes detailing technique, rules of thumb, pitfalls, and other nuggets of wisdom. After considerable delay, I finally feel confident in sharing them with you. There’s only one problem – it’s a boatload of brain-bits that can’t be dumped en masse on an unsuspecting blog-reading populace. The topic of sous vide cooking is far too vast to address adequately in a single entry, and it wouldn’t be fair to those of you who find yourselves on The Best Food Blog Ever seeking knowledge on how to properly sous vide a specific kind of food. This is why, from this point forward, you’ll begin to see more discussion about specific dishes that use the sous vide technique. Have I tried to sous vide eggs? Yes. Did I like the outcome? Eh. What’s my favorite dish to prepare sous vide? You’d be surprised. From a practical standpoint, sous vide cooking is no more complicated than boiling, except everything occurs at a much lower temperature. Here’s the elevator pitch – the entire point of cooking is to bring the internal temperature of your food up to a certain level, whether that be the temperature associated with a medium-rare steak or a minimum safe temperature to ensure that your chicken breast doesn’t make you sick. Every technique that you would implement in the kitchen involves the application of heat that cooks your protein from the outside-in. That’s why even the most perfectly cooked steak will come off of the grill or saute pan with a margin of over-doneness surrounding the medium-rare core. It’s the reason why it’s hard to cook those ultra-thick pork chops that lovingly beckoned you to free them from their glass case at the market. The magic of the sous vide technique is this – your food still cooks from the outside-in, but since you’ve placed the food into a water bath at a set temperature, your food will never cook past that temperature, no matter how long you leave it in the water. A steak cooked to medium-rare has an internal temperature of between 130 and 135 degrees. Set your sous vide setup to maintain that temperature, hold the meat in the water bath long enough, and you will be assured of having a medium-rare steak on your table for dinner that is exactly medium rare from edge to edge. That’s the essence and simplicity of sous vide. Beyond precise control over the outcome of your meal, sous vide also offers the unique opportunity to experiment with foods in a way that would be impossible to do in a safe manner using any other technique. Take chicken, for example – we’ve been trained to cook chicken to an internal temperature of 160 degrees, which is the temperature at which harmful bacteria dies. A lot of cooks, just to be safe, will bring their chicken to even higher temperatures just to achieve greater reassurance. But once the internal temperature of chicken exceeds a certain level, the proteins begin to change, water is expelled, and your dinner begins its transformation into a dried-out, overcooked mistake. With sous vide, you don’t have to cook your chicken to 160 degrees. While it’s true that bacteria dies at 160 degrees, what isn’t often mentioned is that 160 degrees is the temperature required to kill bacteria instantly. At lower temperatures, it just takes longer for the bacteria to die. With the constant temperature control that’s available with sous vide, it’s entirely possible to hold any protein at a set temperature for the appropriate duration required to eliminate the risk of bacteria. You have, most assuredly, heard of this before. It’s called pasteurization. Is there a downside to the sous vide technique? Well, for one thing, most food looks horrible when it emerges from its time in the bath – chicken looks boiled, and beef has an unappealing grey character that reminds one of bad school cafeteria lunches. But it’s nothing that a quick sear in a hot pan with the fat of your choice can’t repair. Also, you have to make some adjustments to the way that you season your food if you intend on cooking it sous vide. Fresh garlic, which is typically the first ingredient to hit the chopping block in my kitchen, is out – the vacuum seal locks in and intensifies flavors, so garlic would overwhelm, in a bad way. The same is true, in my case, with fresh pepper – while many sous vide recipes call for salt and freshly-ground pepper, I find that the sous vide technique tends to bring out a variety of bitter and generally unpleasant notes from my Tellicherry peppercorns. Generally, any ingredient that should be kept out of the vacuum seal during the sous vide process can be added later during the pan-sear, or as part of a sauce. So, after all of that, let’s talk about the Sous Vide Magic setup by Fresh Meals Solutions. The Fresh Meals Magic sous vide system consists of a Sous Vide Magic controller, an air pump, an immersion heater/bubbler, and a 18 liter clear plastic bucket. The bucket holds your water, into which you place your vacuum-sealed pouches of food. The immersion heater rests in the bucket and is cycled on and off by the controller box in order to maintain a constant temperature. A small sensor plugs into the back of the controller, with the other end resting in the water and providing constant temperature readings. The air pump, which is the same pump that you would find in an aquarium shop, ensures that a stream of bubbles circulates throughout the water, eliminating hotspots. There are a few connections to make, but it quickly becomes second nature after you’ve done it once or twice. To get started, just plug the Sous Vide Magic controller into a power outlet, flip the switch, and program in your desired temperature. At any given time, you can glance at the readout on the front of the unit and see the current water temperature, as well as the target temperature. Using hot tap water, which comes out of my kitchen faucet at around 105 degrees, it usually took about 15 to 20 minutes for the water to reach target. During this time, you season your food and vacuum seal it using a FoodSaver device. Once the water bath is ready, place your bags into the water and leave them there for at least the minimum suggested cooking time, which varies depending on the protein you are using and its size. When you are ready to serve, cut open the bags and give the contents a quick sear in a hot pan. I mentioned that one of the benefits of the Sous Vide Magic system over other alternatives is its scalability. With the immersion heater, there’s really no limit to the space that you use to house your water bath – you could conceivably cook multiple pieces of meat in the sink, or a bathtub, even…in any vessel up to 36 liters. The 18 liter bucket provided by Fresh Meals Solutions with the purchase of a kit is really for the sake of convenience, more than anything. The Sous Vide Supreme limits you to the dimensions of the unit, topping out at 10 liters. It’s fine for a steak or two, but you wouldn’t be able to pull off a large sous vide dinner party. Admittedly, the Sous Vide Magic system doesn’t look as refined or elegant as the tabletop unit offered by Sous Vide Supreme, but this is a solution for those food geeks among us who care more about delivering a flawlessly prepared steak or salmon filet than showing off some new piece of kitchen gadgetry. It does the job, and it does it well. Check back here for sous vide recipes, tips, and tricks, coming soon. The best croissants that I’ve ever had on this side of the Atlantic. A tour of the kitchen of one of the top French restaurants in America. Exclusive tastings of the world’s premier champagne and top flight tequilas. Unprecedented levels of access to executive pastry chefs and chefs de cuisine. A treasure chest made of chocolate and filled with ice cream and cheesecake. A tower of nachos that would defeat even the most gluttonous of Americans. A scantily-clad woman, a volcano, and a vat of water. These are a few of the highlights of four days spent in Las Vegas as invited guests of Caesars Entertainment on their first-ever Taste Tour, a whirlwind array of restaurant visits, cooking demonstrations, and behind-the-scenes peeks at the inner mechanisms of the culinary machine that drives the food service behind 11 properties. Faced with a stack of business cards, a notepad full of scribbled observations, and a flash drive that’s been thoughtfully packed with professional photos that are much better than anything that I could have ever taken, my task becomes clear: document this adventure for you, the readers of The Best Food Blog Ever. Over the next few weeks, I beckon you to join me as I share my insight into a world that is rarely seen by most members of the public. I’ve got a whiteboard that’s overflowing with entry titles, and it’s time to start crossing them off, one by one. Somewhere on the western outskirts of Philadelphia, in the living room of the well-appointed home of a stranger, I find myself sitting on a couch with renowned New York Times food columnist Amanda Hesser. Nursing a pleasant buzz from a hearty quaff of Victory Brewing Company’s Festbier, we’re discussing the benefits and disadvantages of no less than three different Twitter clients that I have installed on my iPhone. Nearby, a dining table creaks under the weight of pimento cheese, venison stew, stuffed mushrooms, cold sesame noodles, and a myriad of other delectable, homemade dishes. 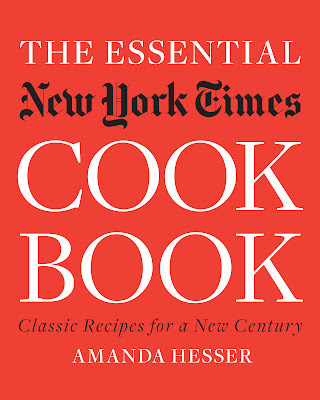 The story begins six years ago, with Hesser putting out a call for readers to submit their most beloved recipes from the pages of The New York Times. Six thousand responses later, and after years of culling, testing, and refining, Amanda Hesser has debuted The Essential New York Times Cookbook: Classic Recipes for a New Century, a collection of nearly 1,000 dishes spanning a culinary epoch that began in the 1850s and ends with me standing over a food processor last Tuesday night, making pimento cheese. To celebrate the release of the book, a call to arms was heard throughout the City of Brotherly Love, beckoning food bloggers to a potluck, hosted by the author herself, Audra Wolf of Doris and Jilly Cook, and Marisa McClellan of Food in Jars, with libations to be provided by Victory Brewing Company. “Food bloggers!”, I said to myself as I read the invitation, “I are one!” And so a plan was hatched to attend the fete. But first, I had to decide what to bring. And before that, I needed to get my hands on a copy of the book. Thanks to living in the future, Amazon was able to drop a copy of The Essential New York Times Cookbook on my porch the very next day. I hefted the 4.6 pound work onto my coffee table and started flipping, making mental notes, poring over interesting recipes, and flipping some more until I reached the index. The first impression that one gets from the book is how strikingly organized it is, for such an extensive collection of recipes. Yes, we have grown accustomed to expecting chapter headings leading us to soups, salads, poultry and game, fish and shellfish – but what surprises and delights the harried cook is the breakdown, for example, of the soup chapter into listings for cold soups, vegetable soups, soups for each season, even soups for 8 and soups for 2. I decided to make two easy dishes that would survive the trek in below-freezing temperatures to University City. Pimento cheese was a natural choice, seeing that I had used other recipes to make it many times before, and could easily adapt to a different preparation. The other dish, Take-Out Style Sesame Noodles, was selected partly due to its ease of preparation and partly due to my ongoing quest to find the perfect cold sesame noodle recipe (hint – the search is over). On Wednesday evening, our GPS guided us to a row of darkened homes on a short street that was made to appear even narrower by the fact that the houses sat above us, with imposing brick and concrete stairs arching upwards at a sharp angle. We made our way to the house number that was designated on the invitation, rang the doorbell, and basked in the warm glow of incandescent lighting as Audra Wolfe answered the door and invited us into her home. Once inside, I set the dishes on the table and made a point of making nametags – not for myself and my wife, but for the dishes – “Hi, my name is Pimento Cheese.” With that duty discharged, I scribbled my name and site name in sharpie and proceeded to mess up my “look” with an inartfully placed adhesive rectangle over my heart. I made small talk with the other invitees and started grazing, taking small samples of everything. Over the course of the next few minutes, more folks arrived and the table started filling up, with the statistically improbable outcome of my pimento cheese meeting up with two of its twins. At least my sesame noodles stood alone in their spicy, peanut-y goodness. Amanda Hesser, as it turns out, is far more approachable than I had ever anticipated, which is not to say that I expected her to be mean or anything like that – she’s just an incredibly friendly and open person. Someone who, despite her extensive list of accomplishments, still retains the humility to write her name out on a name tag at a party featuring her own book. We found each other hovering over the three bowls of pimento cheese, and started chatting amiably like soccer moms in the produce department of a grocery store. At one point, I asked her if she had ever had the opportunity to try any of the offerings from Victory Brewing Company (a local favorite which, coincidentally, is ten minutes away from my house) and, when she said no, I took that opportunity to introduce her to one of my favorite beers, Festbier, a lovely Oktoberfest-style lager that uses all German malts and whole flower European hops. With the bottles of Festbier being in the shortest supply out of all of the varieties, we were lucky enough to snag two of the last bottles. While we were at it, she also had the good fortune to try a sample of the Bee Sting Ale, the homebrewed creation of our friends Melissa and Ray of Bathtub Brewery. And there we all were, my wife and I, Melissa and Ray, Dave Speers from Victory Brewing Company, and Amanda Hesser – drinking beers, crammed into the narrow hallway next to the staircase. It felt like college again, but with more flavors of awesome than the human mind can even begin to imagine. And without classes to attend the next day. As the party wound down, I was glad to see that all of the sesame noodles were consumed, saving me the trouble of hauling the leftovers back home. We rendered the last of the pimento cheese onto a paper plate, and my wife was kind enough to give the bowls a quick wash. We bid goodbye to Amanda, Audrey, Marisa, and all of our friends both new and old, and scurried off into the dark of night, just a bit warmer than when we had arrived. This past summer was not a fruitful gardening season by any stretch of the imagination. Our assumption of the new roles of full-time parents to our baby daughter, in combination with the sparse bouts of rain and a several runs of too-hot summer temperatures, meant that we weren’t able to grow much of anything. To be honest, I hadn’t gotten around to planting anything other than a few tomato and pepper plants and, by the middle of August, thanks to the unfavorable weather patterns, they still had not yielded anything worth writing about. This is in stark contrast to last year, when we enjoyed a bumper crop of tomatoes, along with a healthy surge of fresh herbs and leafy greens that afforded me free food and ingredients for several months. We ate fresh tomatoes off of the plants for a good part of the summer, and when Labor Day rolled in, I visited a farmstand in the Amish country, picked up a box of slightly bruised tomatoes for $5, and canned enough of them to produce almost twenty quarts, which were ushered onto a shelf in the basement, ready for sauce on a whim. This year, by the time we visited the farmstand, well after Labor Day, all of the tomatoes were gone and had been replaced by squash and apples. With some degree of regret, I packed up my canning supplies and stowed them away in the dark recesses of my basement until next year. The change in weather brings changes in my culinary urges. In an attempt to satisfy a particularly strong craving for cider doughnuts, we stopped at our local orchard and farm market in mid-October and were surprised to find the grounds overflowing with hundreds of people. The lines snaked through the store, past the bakery counter, and outside to a tent which sheltered the seasonal placement of cash registers. Each person in line had the triumvirate selection – a basket of apples, a pumpkin, and a quart or gallon of apple cider. Upon seeing the mountains of fiery orange pumpkins, and smelling the apple-scented air, my longing for the lazy heat of the summer was extinguished, replaced by the remembrance of the charms of autumn and an overwhelming desire for apple-everything. Pie. Cobbler. Stuffed. Roasted. You name it. I had come across a recipe for apple butter that was made entirely in a slow cooker, which suited my schedule perfectly. Intrigued, I picked up a few pounds of firm Granny Smiths and McIntosh apples and, for the first time in my life, one of those peeler/corer contraptions that operates on a hand crank. The recipe was quite straightforward – fill a slow cooker with chopped apples, some sugar, a bit of apple cider, and, at your option, cinnamon, cloves, and allspice. Turn on and drop out. Using the peeler brought me the same joy of discovery as the first time I used a (good quality) mandoline. I jabbed an apple onto the spike, turned the crank, and was almost immediately rewarded with a peeled and cored apple that was already conveniently separated into rings. Fair warning – apples that are in the least bit on the soft side will tend to gum up the works, but for firm specimens, the thing works like a charm. I piled the apples into the slow cooker, added the rest of the ingredients, popped the glass lid over it, and turned it to the High setting. For the first few hours, it seemed as if nothing was happening – I would peer down through the glass lid and see the pale, cinnamon-bespecked apple slices staring back up at me. I went upstairs to do some work. At some point, I returned to the kitchen to grab a cup of coffee and, halfway down the stairs, was greeted by the warm smell of the holidays, which had permeated the entire first floor and was now quietly invading the rest of the house. Checking on the slow cooker, the top layer of apples had still retained their shape, but a quick stir with a wooden spoon caused them to disintegrate. By the sixth hour, the apples had turned into a chunky, mahogany-colored paste. I brought my canning supplies up from the basement, filling the large black pot with water and setting it onto a burner and running the jars through the dishwasher to clean and sterilize them. The actual canning process went very quickly – after ten minutes in boiling water, I had produced about eight or nine half-pint jars of apple butter, suitable for gifting or for hoarding in the basement. And, in a couple of weeks, when I take the last jar of summer tomatoes for sauce, I know exactly what’s going to take up that shelf.